Andy Weber was one of the Cubs’ last draft picks of 2018 to sign their initial pro contract. As a result, his pro career got started a little bit later than everyone else. When he finally finished his orientation and suited up in Mesa, it’d been almost 2 months since he last played a game that mattered. 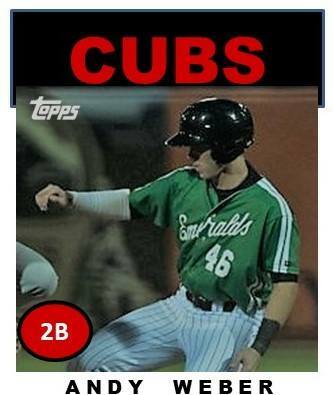 The Cubs selected Weber in the fifth round of the 2018 draft. A left-handed hitting second baseman, Weber has decent size 6 ‘1” and 190 pounds, but he has shown throughout his college career at Virginia that he can do two things – hit for average and drive-in runs. In today’s modern world, you can find pretty much anything that you want on the Internet. For Weber, I wanted to see a couple things on video that either showed his hitting style or his hitting approach. I got lucky on both. One thing to like about Weber’s hitting style is that he uses the whole field and that he seems to be unfazed by the moment. He looks extremely calm in the box. TIE GAME!!! Andy Weber with a two-run single in the B10 and we're back to even! Here is Weber cranking out a HR. HOME RUN!!! Andy Weber ties the game with one swing! His third long ball of the season! As a Cub, it has taken him a bit of time to shake off the rust. At Mesa, Weber began his career with a 2-for-23 start. After an 8-for-24 stretch, Weber quickly found himself headed to Eugene. As an Emerald, he started hitting as soon as he stepped in the box. In his first 5 games, he hit .471 with a .565 OBP. However, after 9 games, he put up a very high K rate over 33% and a low walk rate at 7.1%. Those need to change next year. His biggest strength is that he comes across as one cool cucumber in the batter’s box. As well, he is much more versatile that first thought. Weber has played SS, 2B, and 3B all twice in his first six games. That kind of differentiation is special. I really like his approach and his ability to hit to all fields. I wouldn’t get too hung up on his stats this year. Next year will be the bigger barometer. His first full year in 2019 should be fun to watch. He should start at South Bend. Then again, how much he destroys the ball the next three weeks, in fall instructs, and in spring training might put him in play to begin at Myrtle Beach.